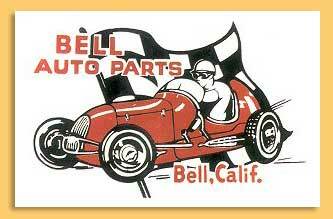 It was really success that changed the outlook for Bell Auto Parts. This came in two waves. The first was the huge growth of the speed equipment and aftermarket business, that Bell Auto Parts was instrumental in developing. It became so big that more traditional ways of marketing and distribution were needed. The multiple rolls of Bell Auto Parts as a retail store, catalog store, warehouse distributor and manufacturer were confusing for customers and employees. In 1955 Roy Richter incorporated the Cragar Equipment Company reviving the old racing name that George Wight had purchased from Crane Gartz in 1933. The Cragar name was used on most new parts that were developed. The second wave of success was the explosive growth of two products, the Bell Helmet and the Cragar SS wheel. In 1954 Roy began to manufacture the Bell Helmet. Bell Auto Parts was already selling many Anderson and Cromwell (British) helmets through its distribution network. Roy knew the potential for this business. This is quite a story in its self and again I will refer you to Art Bagnall's book Roy Richter, Striving for Excellence to learn more. The Cragar SS wheel was not a copy but a new innovative way to manufacture custom wheels. Roy's team had created a very strong and truly attractive wheel that was suitable for racing. By 1964 the Bell Helmet operation had moved to Long Beach and the Cragar wheel business moved to South Gate and it would soon move again to Compton. In 1965 the demands of these manufacturing businesses was causing cash flow problems for Bell Auto Parts. Then in 1967 Roy legally separated the businesses and created a holding company called Roy Richter Enterprises. The businesses were later sold off. In 1971 the Wynn Oil Company purchased control of Cragar Industries and Bell Helmets. Later in 1978 the remaining companies were sold to long time employees. Desert Dynamics was sold to John Glew and Jot Thorne. The Bell Safety Distributorship was purchased by Kenny Parks. He then started Bell Motorsports. Bell Auto Parts and the remaining inventory was sold to Chuck Strader who ran the business from a location in Huntington Beach for another 10 years. Through all of this Roy was dedicated to taking care of his team. He passed away much too soon in July of 1983.